I’m insanely busy on a gig right now, plus devoting time to taking care of parents, so once again I apologize for the lack of posts. Hopefully, things will die down going into the latter part of August and I can get back to regular posting. In the mean time, I often have to wait a considerable amount of time for a large application to build. 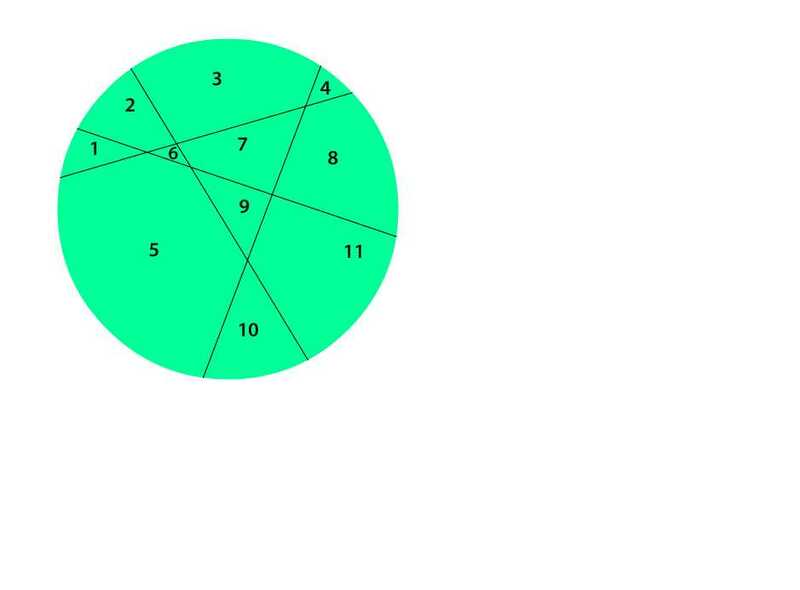 Someone posted an interesting problem (that’s probably pretty old and I’m too lazy to search) regarding the maximum number of segments a circle can be divided into with four lines. For a minute or so, I was stuck on 10, then came up with 11. Here’s one solution. Now, I’m stuck at 11 and no time to think about this problem any more. Anyone see a way to do 12? It might be fun to consider how to prove the maximum number. Ah, once again … too many interesting problems for which that whole making a living thing gets in the way. Hopefully, I’ll have some new code samples for you around Labor Day. Thx!